The Harborfields Field Hockey team after their game with USA Women’s National soccer team player Allie Long. The Harborfields varsity field hockey team has just wrapped up their season and are looking back on it with pride while looking forward to next year’s season with excitement. The girl’s season finished on Tuesday, Oct. 30 when they played against Miller Place at the Suffolk County Championship game and lost in double overtime. Coach Lauren Desiderio is proud of how her girls played at the game and during the season, closing with a record of 11-5. In a game like field hockey, where it takes a team effort to win, it was crucial the girls work together. Desiderio and her staff emphasized team bonding this year, the girls even have a pool party at her house over the summer. In her quest for unity, Desiderio found having balance among her players was important and didn’t put any player above another. She did highlight the leadership demonstrated by her captains as a contributor for their success. Senior and defense left back, Samantha Huntington, was a returning All-State player this season that led the team with senior forward midfielder, Jenna Bergin and junior center-mid, Caroline Dlugisnky. The girls were able to lead by example, showing their dedication to the game while putting in hard work during practice. The team typically practices on grass, but played about half their games on turf fields. This required the players to put in extra work the day before turf games, by spending time practicing their plays on a turf field. It may not seem like a big difference, but according to Desiderio, the field changes the speed and what they can do during a game. “The girls have really learned to adapt to the surface, while sticking to the game plan and our style of play and persevere each game,” Desiderio said. Desiderio feels her girls know how to handle their wins and loses with class. After coaching the team as an assistant for 2-3 years, Desiderio stepped up as the head coach in 2010. Before that, she coached three seasons at Fairfield University, where she played Division 1 field hockey. Now, Desiderio teaches social studies at Huntington High School but finds her allegiance to two schools has not been an issue. This year the team will be graduating a large amount of seniors, like goalie Cate Driver, who had a “fantastic” senior season. But Desiderio is not worried for next year, with great returning players coming back and many fierce competitors moving up from the junior varsity team. Looking to the future, Desiderio wants her returning players to participate in winter field hockey club teams, to keep the girls playing together. Next year, she hopes the team will make it to the County Championship again and win this time. . The Commack Cougars football team notched an impressive win on Oct. 20 when they defeated the Bay Shore Marauders 28-6 at homecoming. Both defenses dominated the first quarter in which neither team was able to put any points on the board. Senior Jordan Scott led the Cougars defense with 14 tackles and 4 sacks. Senior William Pizzolo also managed four sacks, while Joe Slackman and Saul Leon added nine and seven tackles, respectively. The Cougars ability to put pressure on the Marauders backfield helped keep Bay Shore from scoring until the third quarter. After a slow start, the Cougars offense found their rhythm in the second quarter with the help of a 17-yard touchdown pass from junior quarterback Adian McCarty to wide receiver Blake Behlen. The Cougars running game also came to life in the second quarter with a seven-yard touchdown run from junior running back Chris Ioannou, one of his 15 carries for 100 yards in the game. Pizzolo also scored a two-yard rushing touchdown. The senior rushed for 85 yards in the game. Bay Shore tried to mount a comeback with a touchdown in the third quarter, but a 15-yard touchdown pass from McCarty to Scott quickly stopped the Marauders momentum. McCarty finished with 133 passing yards. Sal Davi added a field goal in the fourth quarter to cap off the comprehensive victory for the Cougars. Commack currently sits in fifth place in Suffolk Division 1, and will look to end the regular season on a high note Nov 2 when they travel to Longwood to take on the Lions. 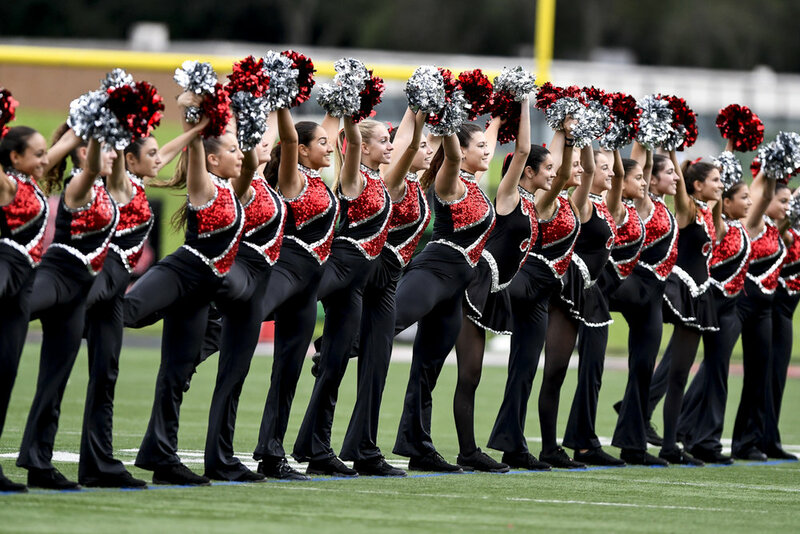 Huntington toppled visiting Smithtown East last Saturday on Homecoming Day, 32-20. The Blue Devils came from behind before a crowd of about 2,000. Special events were held throughout the district in the run-up to Saturday’s festivities. Thursday night’s high school dance proved to be a fun time for everyone, and Friday’s pep rally in Louis D. Giani Gymnasium was a high octane affair as varsity teams were introduced to the student body and faculty to deafening applause. Athletes performed short skits and the Blue Devil marching band and color guard put on an awesome display. There were also performances by the Highsteppers and Ready Step dance teams. Saturday’s late morning parade drew students and parents from all eight schools in the district marching behind banners. The Blue Devil marching band performed along the parade route, drawing merchants and customers out of stores and onto sidewalks. Named as this year’s Homecoming Day King and Queen were Danny Arias and Ashlyn Case. The pair were formally crowned by Principal Brenden Cusack and Superintendent James W. Polansky. 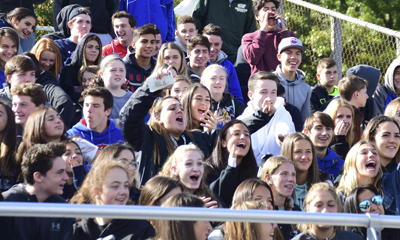 Alumni spanning more than 70 years attended Saturday’s football game against Smithtown East. The group of graduates included more than a few from recent classes. Huntington quarterback John Paul Paci had his biggest day of the season completing 10-of-15 passes for 275 yards, including a 52-yard touchdown pass to Chad Rowe. The Blue Devils also scored on an eight-yard run by Eric Yards, a nine yard dash by Nasir Youngblood and a 42-yard gallop by Sebastian Abreu. Huntington also found the end zone on a 41-yard interception return by Jack Stewart. The Blue Devils scored first in the game, but missed the point-after. Smithtown East responded by scoring on a 23-yard run and successfully converting the extra point to take a 7-6 lead. It was all Huntington the rest of the way, although the Bulls did manage to stage a late-game rally that kept the big crowd on the edge of its seats. Jordan McCoy had four receptions for 125 yards for the Blue Devils and Tazadon Smith and Jon Koumas notched quarterback sacks. While Huntington made some mistakes, including racking up a few costly penalties, overall the team played well. The Northport High School marching band, accompanied by the Flagline and Tigerettes, gave a riveting halftime performance during homecoming. 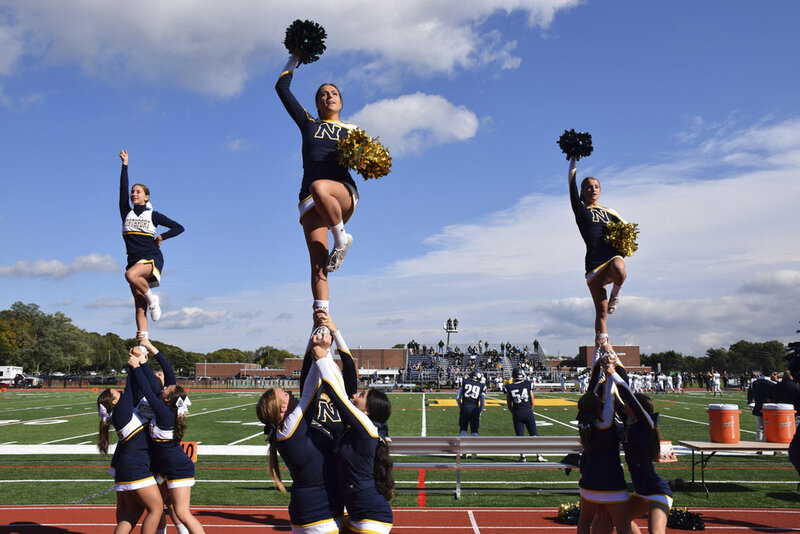 Homecoming Court members Daniel Rodriguez, Pegeen Friese who was crowned queen, Trever Koulermos who was crowned king, Lauren Washko, Katie Sierra, Jordan Sipala, Paige Leonard, Katelyn Kullack and Will Loeber were introduced during Northport High School’s halftime show. A crisp fall breeze and sunny skies were the perfect backdrop for NorthportHigh School’s annual homecoming celebration held on Oct. 20. Students, faculty and members of the community donned blue and gold as they packed Tiger Stadium to demonstrate their pride and support of the district’s football team, who played an aggressive matchup against CentereachHigh School, taking the lead in the first few minutes of the game. Tenacity and skill reigned on the stadium field as the tigers dominated the CentereachHigh School team with a final score of 35-6. The day’s celebration commenced earlier in the day with a Hall of Fame induction in the auditorium. Introduced to the community were Max Bartig (Class of 2006), Andrew D’Eloia (Class of 1991), Corinne Gandolfi (Class of 2006), Bryan Quinn (Class of 2003), Jaenine Michealsen (Class of 1986), the 2002 State Championship Girls’ Varsity Volleyball Team and the Northport Tiger Marching Band, Flagline and Tigerettes. Pre-game festivities also included recognition of the football team’s and cheerleaders’ senior members, who presented flowers to a significant other. The halftime show featured the marching band, Tigerettes and Flagline who performed a variety of popular songs for the crowd. Later in the evening, seniors Trevor Koulemos and Pegeen Friese were crowned homecoming king and queen at the dance. Quarterback Quinn O’Hara ran for 120 yards and two touchdowns. He completed 15 of 25 passes for 195 yards and a touchdown. Wide receiver Gregory Borysowski makes the catch down the line to get the first down. Birchwood Principal Anthony Ciccarelli gets a face full of whipped cream at the homecoming festival. Last week the spirit was building across the South Huntington School District. Daily activities at all of the schools energized students and staff. When Friday afternoons’ district-wide Homecoming festival was in full swing, it was obvious that 2018 was going to be a special Homecoming. The Thursday night Powder-puff football game broke attendance records and seniors capped off a great football game with a resounding 4th quarter onslaught. The seniors also took the cheerleading competition in grand fashion. The Friday afternoon Homecoming Festival gathered students and staff along with their families from all South Huntington schools for a fun Fall afternoon. The Friday night bonfire was spectacular, thanks to Huntington Manor Fire Department for their management of a safe and thrilling sight. Each year the Homecoming parade continues to grow, adding community groups, businesses, and numerous organizations as they close down Jericho Turnpike in an annual showing of “Wildcat Pride.” A perfect afternoon greeted the packed stadium for a football contest to be remembered with both teams commanding the lead and Whitman Wildcats prevailing 28-21. It was a week to remember and a day capped with a win on the gridiron. Hills West senior football players pose before last week’s homecoming game. 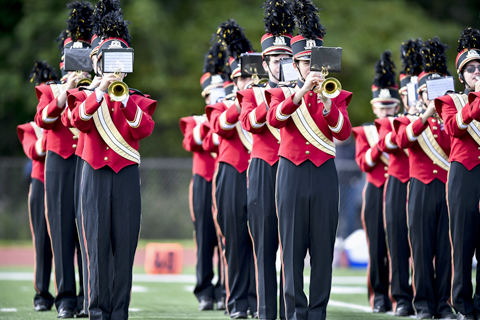 The marching band had the crowd on its feet during halftime of the Colts 41-0 homecoming win. Members of the Half Hollow Hills High School West homecoming court are all smiles during homecoming. 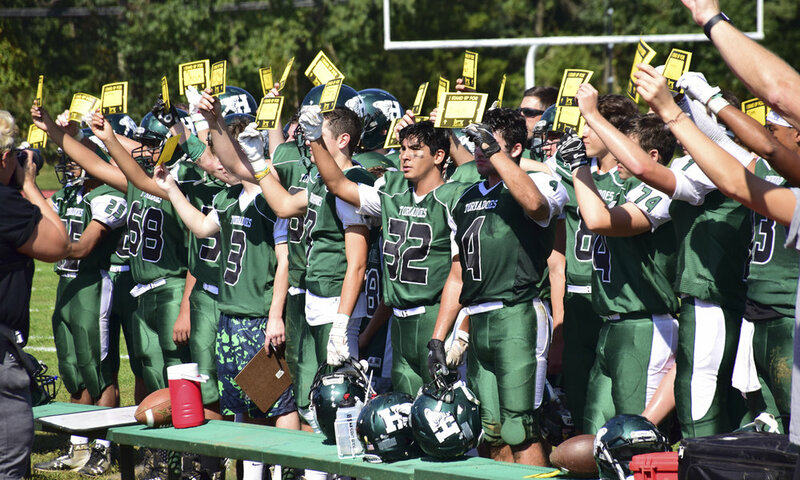 The Half Hollow Hills High School West football team capped off the school’s Homecoming week Saturday afternoon with a dominant 41-0 victory over Islip. From the first whistle to the last, the Buccaneers were never able to stop the Colt’s running game. Dakim Griffin had 13 carries for the Colts, one of which he broke for a 74-yard score in the second quarter on his way to a 167-yard, three-touchdown performance in the game. Senior running back Sadiq Hinds also featured heavily in the game with nine carries for 62 yards and a score. John Jimenez punched in a one-yard touchdown run to cap off the Colts victory in the fourth quarter. Running back Ross Rampolla added to the ground game with eight carries for 24 yards. The passing game was also firing on all cylinders. Senior quarterback Gerald Filardi completed five of his 10 passing attempts, including one for a touchdown in the first quarter to Hinds. Senior Linebacker Jake Cetta led the Colts defense with 10 tackles, while Junior Joey Venezia added eight tackles. Mike Smith had two sacks and Keith Slaughter recovered a fumble to help secure the third shutout of the season for Hills West. The fast-riding Colts will look to improve to 7-1 in Suffolk Division 3 when they travel to Eastport-South Manor on Saturday at 1 p.m.
Head coach Richard Reichert, who is retiring at the end of this season, has led the St. Anthony’s High School football team to 5-0 after a 56-36 victory in last week’s game. St. Anthony’s varsity football team has had a sensational season so far. Coming off a win in their homecoming game last week they are gearing up for their championship game and the final home game of their esteemed head coach. The team found themselves victorious at their homecoming game against Cardinal Hayes High School, coming out on top, 56-36. The win put them at 5-0 in their league. The Friars will face the other 5-0 team in their league, Iona Prep, for the Triple A Division Championship, this Friday, Oct. 19, 7 p.m. at St. Anthony’s football fields. The game marks the retirement of Richard Reichert, the team’s head coach for the past 32 years. Although, the game does not affect the playoffs, it is still crucial for the team to keep their winning momentum going. Reichert hopes that the team will make in playoffs and believes they have a chance at making it to States this year. Last year, the team made it into the finals before the State game but lost. This season the team may be strong enough to go all the way. With this shift, the QB is crucial to to the team. Reichert believes this year he has “the best one around.” Quarterback Greg Campisi has been playing “tremendous” in his third year as a starter, and the coaches give him plenty of freedom. Running back Kyle Angus has been a strong player that has come into his own on the team, scoring five touchdowns in last week’s game and two the week before. The squad’s top receivers are Greg Randall, Danny Parker and Jaden Jernigan. “We’re just really balanced, we have a great core of receivers and the quarterback is able to spread it around,” Reichert said. But Reichert is humble in his abilities as a coach, with an overall record of 264-65-3, he ties for the second most all time wins on Long Island. When asked about this stat, Reichert joked that it makes him feel old. But someone doesn’t have this many wins from time alone. “We have great coaches and great players, so it was really just the matter of that combination that resulted in a lot of wins,” Reichert said. A graduate of the St. Anthony's class of 1970, Reichert knew he wanted to come back and coach at his alma mater. After retiring from the Nassau County Police Department with 25 years of service as a police officer, Reichert took up coaching and teaching at St. Anthony's. He has coached for 39 years in the football program, starting as head coach for the freshmen team, then the junior varsity coach and would became varsity head coach in 1987. Why hang up the cleats now? Reichert will continue to teach physical education at St. Anthony’s High School and coach junior varsity golf. He will still attend St. Anthony’s football games, he added. Taking over as head coach is Joseph Minucci, the school’s athletic director and former player for Reichert. For his final home game, three decades of players Reichert has coached will be coming back to the school to pay tribute to their coach. He tries to keep in touch with his past players and has added some to his coaching staff. The Elwood John H. Glenn High School football team improved to 5-1 last Saturday when they recorded a 48-21 victory during homecoming over the Phantoms of Bayport-Blue Point High School. The homecoming victory moves the Knights into second place in Suffolk division 4, and capped off a day of celebration in Elwood. 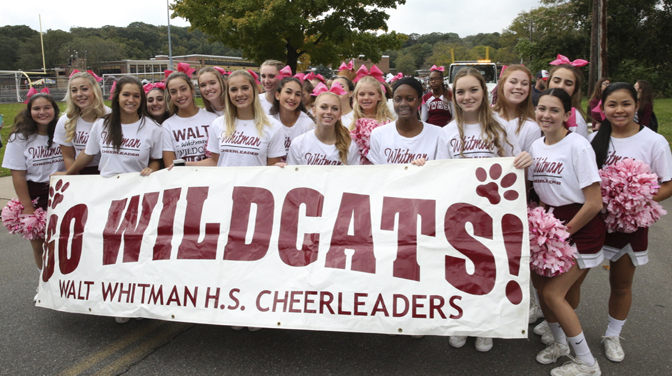 The homecoming celebrations kicked off with a parade led by the school’s kickline and pep band. Homecoming king and queen Patrick Ancewicz and Haley Eno headed a procession of floats constructed by each class. After the parade, the crowd filled the football stadium to cheer on the Knight’s high-powered offense. Glenn dominated the first quarter. Senior quarterback Kyle Szokoli scored the first points of the game, capping off a drive with a one-yard touchdown run. Szokoli had 13 carries for 107 yards in the game. The Knights took a 14-0 lead when Szokoli completed a 15-yard touchdown pass to senior receiver Daysean Johnson. It looked like the game was going to be close after the Phantoms scored 13 unanswered points in the second quarter, but Glenn extended the led to 21-13 at the half when Szokoli found Johnson with a 10-yard touchdown pass. Elwood superintendent Dr. Kenneth Bossert unveiled the first two inductees into Glenn’s new Wall of Fame. 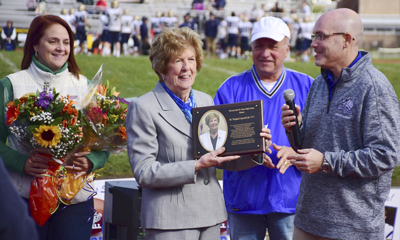 Dr. Virginia Cancroft, who served as the principal of Harley Avenue School for 24 years, and the late Master Sergeant Christopher Raguso, a Class of 1997 alumnus who died during a military mission near the Iraq-Syria border in March, became the first two names on the Wall of Fame. It was all Knights when the homecoming game kicked off again for the third quarter. Szokoli picked up where he left off with a 15-yard touchdown pass to running back Justin Tiernan. Tiernan also had 18 carries in the game for 144 yards and a touchdown. The Knights defense also stepped up in the second half. Nick Ford recorded two sacks in the game, and Rocco Fratarcangeli had a 20-yard pick-six that gave Glenn a 41-13 lead going into the fourth quarter. In the fourth quarter, junior quarterback Thomas Giaramita found Johnson in the endzone with a 35-yard touchdown pass, giving Johnson three touchdowns and 75 receiving yards in the game. Gio Rinaldi and Justin Vega also helped bolster the Knight’s passing attack with 71 and 24 receiving yards, respectively. Sean Ryan added six carries for 45 yards in the victory. The Knights will face a tough test on Saturday night when they travel to Mt. Sini to take on the undefeated Mustangs at 6 p.m. Spirits are high for the Commack boys varsity soccer team which has dominated the field to stay undefeated this season. The boy’s record stands at 12-0-1, after a 4-0 win Wednesday afternoon over Longwood. Coach David Moran gives all the credit to his players who put in hard work at practice and during games. “We’re really deep, we have 16 seniors who show leadership every day and no matter who we’re bringing off the bench we’re getting maximum effort from all the guys,” Moran said. Five senior captains lead the team: Matt Cozetti, a striker, League I Player of the Year and all regional player last year, leads the team in scoring with 14 goals and six assists. Center midfielder Tyler Meotti is known to control the pace of the game. Striker Aidan Keenan is a strong forward who has scored five goals and seven assists. At a hulking 6’3’’ it is difficult for opponents to cover him. Moran calls his top two defenders “thunder and lightning.” Thunder is center back Liam Rothar, a strong presence in the middle who wins 50/50 balls and headers, playing every game like it’s his last. Lightning is left fullback Matt Newfield whose speed on the fieldis a constant threat. And goalie Brian Mirman, while not a captain, is referred to as “The Great Wall of Mirman.” He has not given up a single goal this season. Forward Matt Cozetti is one of 16 seniors on a deep Commack squad. Moran began volunteering as an assistant junior varsity coach and took over as coach when he began to teach at Commack High School. He moved up to be the assistant varsity coach and was with the team the last time they won the state title in 2014. He took over as head coach in 2015. He also coaches junior varsity basketball and is an assistant varsity lacrosse coach. But he admits, soccer is his true passion to coach, even though the game requires far more endurance and quick thinking. The Cougars look to keep their unbeaten streak alive when they travel to Sachem North on Friday, 4:15 p.m. The new scoreboard that towers over the turf field at Half Hollow Hills High School West has been alight with some impressive scores this season as the Colts football team has played their way to an undefeated record. The Colts are currently tied atop the standing in Suffolk Division 3 with a 5-0 record. The Colts’ unbeaten record has earned them the number two ranking in Newsday among small schools Island-wide. Hills West’s latest victory came last Saturday when they traveled to East Islip and shut out the Redmen on their home turf. All of the scoring action took place in the first half of the game, with both defenses finding a strong foothold in the second. Senior running back Sadiq Hinds was the feature back for the Colts in the game, and he asserted his strong running style early. Hinds broke a 70-yard touchdown run in the first quarter to give Hills West a 7-0 lead. Hinds had a total of six rushing attempts in the game for 93 yards. In the second quarter, senior quarterback Gerald Filardi led Hills West on two scoring drives that were each capped off with a big play. Filardi complete four passes for 84 yards. First, Filardi completed one of his eight passing attempts to junior running back Justin Brown. The catch was Brown’s only of the day, but he made it count. Brown took the pass 55 yards into the end zone to give the Colts a 14-0 lead. Brown also had eight rushing attempts in the game for 20 yards. Next, senior running back Deyvon Wright once again showed how elusive he could be in the open field when he turned his only rushing attempt into a 40-yard touchdown run. The touchdown put the Colts firmly in charge of the game with a 21-0 lead at halftime. The Colts defense came out in the second half determined to protect the lead on the road. Senior linebackers Michael Carrubia and Jake Cetta each had eight tackles in the game, and Carrubia also managed two pass deflections. Junior Joey Venezia and Senior Cedric Gordon were each able to beat the East Islip offensive line for two sacks. Filardi also stepped up on defense late in the fourth quarter with an interception to stop the Redmen from scoring and preserve the shut out and 21-0 victory for the Colts. Half Hollow Hills West will look to keep their unbeaten steak alive on Saturday when they host Westhampton at 1 p.m.
St,. Anthony’s girls soccer team is undefeated so far this season, and nationally ranked by Top Drawer Soccer. The St. Anthony’s girls varsity soccer team are in their prime and have no plans of slowing down until they win the New York State Championship again this year. The team is undefeated this season, with a 7-0 record and many shutout games. Led by coach, Sue Alber, the team has now secured the number three ranking in the country for girls high school soccer from Top Drawer Soccer. After coming off a win with a game against Rich, New Jersey, a team that ranks in the top 20 teams in the nation, the girls are feeling unstoppable. The team is stacked this year with a lineup of players who all have a lot of talent, according to Alber. She does admit that they have weak spots but her players are able to make up for it. Some key senior players graduated last year, but the team was able to pick up two skilled junior girls as players this year, who could not play previously due to club team commitments. She describes the senior class as very strong players, while commending her junior class for being attack minded players. Many of her players are returning from previous seasons, which makes them all well versed in what they need to do to win. Her three senior captains: Lauren Haggerty, Caroline Nuttall, and Brianna Passaro have helped to set an example. This is Alber’s fifth season coaching for the girls soccer team and since she picked up the position has run possession and attacking formations and plays. When she was approached by a board member and a friend whose daughter played there to become head coach, she was intrigued by the school’s high level of skill. Her top assist and goal score leaders in games are forwards Brianna Passaro and Brianna Jablonowski, who are both “lethal up top”. They are joined by juniors, Victoria Mule and Nicole Gordon who unleash “havoc” on other teams when attacking. The team has been able to prevent opposing teams from scoring with the help of Kaitlyn Mahoney, their goalkeeper. She is aided by midfielder Lauren Haggerty and defenders Christine Fabrizi and Sophia Iaccino, who don’t allow many chances for teams to score during games. But Alber feels confident her team will succeed due to their unity and camaraderie within the team. She describes them as tight knit family. “I think we’re just a group of 29 sisters really,” Alber said. Despite the football team’s struggles on the field, Harborfields High School students made the most of homecoming by raising money to help fund research for childhood cancer. The Harborfields football team has endured a tough start to the season, and things didn’t get much better Saturday when they suffered a 29-26 defeat during homecoming at the hands of Eastport-South Manor. 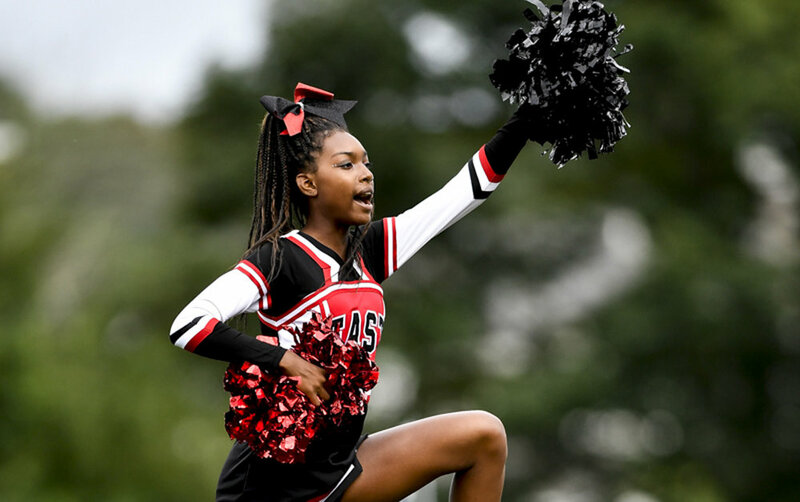 The Tornadoes were looking for their first victory of the season after starting 0-3 with losses to Comsewogue, Islip and Westhampton, and they hoped the enthusiasm of the homecoming crowd would spur them to victory. The students kicked off the day with a homecoming parade that traveled from the Harborfields Public Library to the high school and featured floats with the theme “Generations: HF Through the Years.” Seniors Eric Werbitsky and Kate Driver were crowned homecoming king and queen. Harborfields students joined the Greenlawn Civic Association in their “Greenlawn Goes Gold” movement during homecoming. Sophomore Natalie Pedrazzi helped put the plan into action, and all funds raised were donated to Maggie’s Mission, a local organization that supports awareness and funds pediatric cancer research. Maggie’s Mission was created in honor of Maggie Schmidt, a Harborfields High School student who lost her battle with cancer in 2017. Students and fans packed the stands after the parade for the kickoff of the homecoming game. Both defenses were solid to start the game, and the first quarter ended with the teams tied 0-0. Harborfields held its first ever “Stand Up 2 Cancer” event, initiated by student Catherine Capodanno, at the end of the first quarter. Players, students and community members all over the stadium held up golden signs in recognition of loved ones who battled or are battling cancer. The scoring opened in the second quarter. The Tornadoes got on the board after a 89-yard touchdown run by Thomas Sangiovanni, who finished with 100 yards rushing and 23 receiving yards in the game. The Sharks from Eastport-South Manor also got their offense going and led 15-6 at the half. In the second half, Harborfields junior quarterback Jonathan Osumn was a bright spot for the Tornadoes. Osumn broke one of his six rushing attempts for a 60-yard touchdown in the third quarter. He had 147 rushing yards in the game. Osumn completed two touchdown passes in the fourth quarter during a desperate comeback attempt. The first went for 53 yards to senior Joe Mitchell, and the second was a 16-yard pass to junior Michael Panareillo. The Tornadoes didn’t have enough wind to complete the comeback and lost by a final score of 29-26. Harborfields will look to notch their first win when they travel to Hauppauge on Friday night to take on the Eagles at 6 p.m. The Half Hollow Hills High School East football team kept the crowd on its feet during last Friday’s Homecoming victory over Copiague. 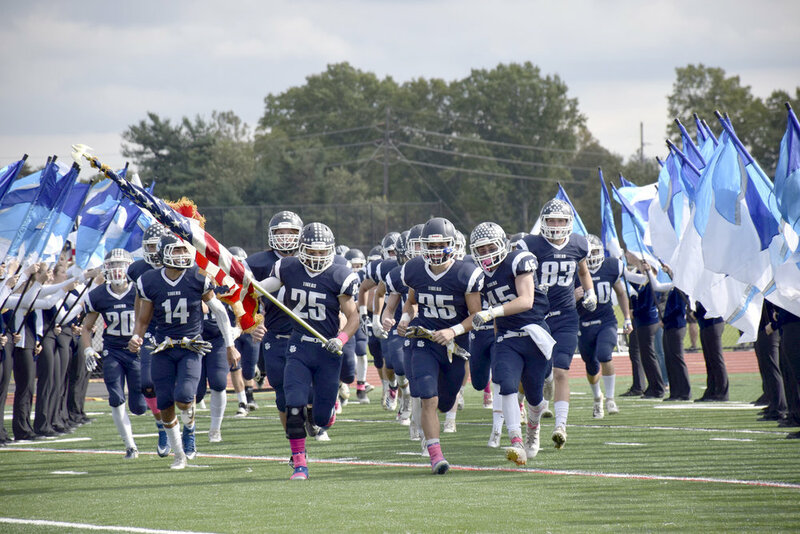 The Thunderbirds entered the game with a disappointing 0-2 record in Suffolk Division 2 after losses to Northport and Smithtown West to start the season, but last year’s county semi-finalists were able to ride the Homecoming game energy to their first win of the season. Head coach Michael Maratto praised his team’s sprit before the start of the season, and it was on full display last week as they outplayed the Eagles of Copiague on both sides of the ball. 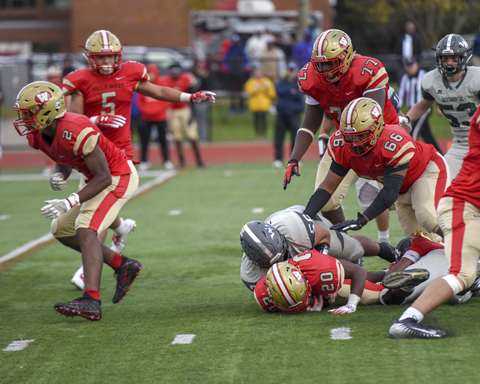 The Thunderbirds offensive line, led by senior center Paul Bruno, set the tone early to help establish the run for Hills East. The Homecoming crowds were in good spirits early after an eight-yard touchdown run by junior running back Nyrle Sevilla opened the scoring. The Eagles ran the ensuing kickoff back for a touchdown of their own. Maratto was able to refocus his young squad after the setback, and they shutout Copiague until the fourth quarter. Sevilla scored his second touchdown of the game, and the Thunderbirds defense forced a safety to give Hills East a 16-7 lead at the end of the first quarter. Hills East scored 23 unanswered points in the second quarter on the back of strong performances on the defensive side of the ball. Senior captain Jon Spadafora recorded 10 tackles and a sack in the game, while Lewis Matherin added two sacks of his own. Junior quarterback Brett Martin had an impressive second quarter as well. Martin broke one of his eight rushing attempts for a 65-yard touchdown, and also completed his lone touchdown pass of the game to Kahleil Nedd for 23 yards. The Thunderbirds had a commanding 39-7 lead at the end of the first half, and their defense did enough in the second half to keep a comfortable cushion on the scoreboard as the game finished 44-21. In addition his 150 rushing yards and three touchdowns, Sevilla also had two interceptions in the defensive side of the ball. Martin and Spadafora, who ran for 140 and 100 yards, respectively, supported Sevilla’s rushing in the Thunderbirds rushing attack. Kyle Krause rounded out the stat sheet with one reception from Martin for 10 yards. The Thunderbirds will look to continue their winning ways on Saturday when they host the 2-1 Cougars of Centereach High School at 1:30 p.m.
Northport High School girls varsity volleyball team has had success so far this season due to the players devotedness to their team. It seems that hard work and dedication is paying off for the Northport High School girls varsity volleyball team, who have dominated their games this season. The team is currently 5-0, coming off wins against defending state champions Connetquot on Sept. 17, Bay Shore this past Thursday and Riverhead on Tuesday. Led by coach Christopher Fritch, the girls have won every game in three straight sets, aside from the Connetquot match that was 3-2. The system that Fritch implemented when he became head coach three years ago took time for the girls to learn, but it is finally paying off. Before Fritch took over as head coach, the girls played a different style of offense and defense. Fritch admits that he took everything his players knew and changed it completely. Fritch implemented the techniques he used in his six years coaching boys vollyballhad upgrade the teams playing style. The style was unconventional for the girls, who were not used to transitioning between a rotational and perimeter defense. After three years, lots of practicing and running through fundamentals during the offseason, the girls have finally mastered their new plays and know what job they must do. “We wanted to start doing something more complex on offense and then for our defense we look at play percentages, we look at where the holes are,” Fritch said. But the team wouldn’t be where they are without powerful, dedicated players. Captain Sydnie Rohme is a primary hitter and a go-to player when the team is in trouble. Co-Captain Katie Kullack leads and runs the defense, while motivating her fellow teammates. Center Kelly McLaughlin also leads the offense and has phenomenal hands that distribute the ball well. Unfortunately, McLaughlin was sick for their game against Connetquot, leaving the team short an offensive player. After winning against the defending state championships, the team is focused on the present and most upcoming game, looking forward to their next win. The team’s next game is at home against Walt Whitman High School at 5:45 p.m., Sept. 28. 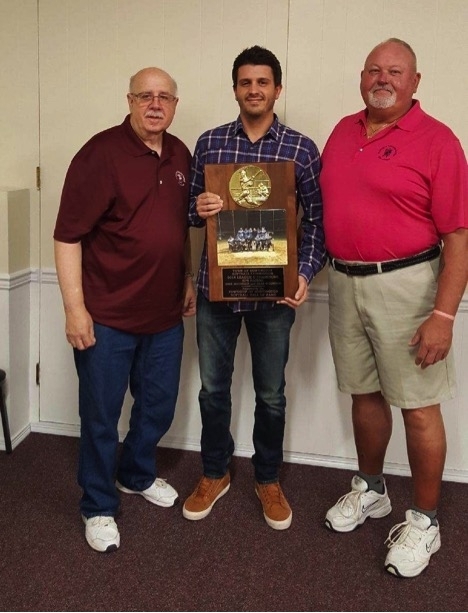 Huntington Softball Hall of Fame President James Coschignano Jr., left, and Vice President Clint Riggs, right, present SPS Nation sponsor and player Mike Ruconich, center, with a plaque for winning Division 2 in the Town of Huntington recreation softball league. The Huntington Softball Hall of Fame recognized earlier this month the top recreational softball team in the Town of Huntington. After a season that ran from the end of April until August, the SPS Nation team was crowned champions of Division 2 of the Town of Huntington slowpitch softball league. Huntington’s slowpitch softball league has been in existence since 1976 and is made up of teams of co-workers and friends who meet for weekly competitive games at the town run softball fields at Milldam Park in Halesite. SPS Nation mustered an impressive regular season record of 22-2 on the way to their championship victory. In addition to SPS Nation, the teams from Axis Construction and the Valencia Tavern captured lower division titles. The Huntington Softball Hall of Fame was founded in 1978 and is comprised of men and women who have played a major role in the growth of softball in the Town of Huntington. SPS Nation’s victory in Division 2 made them Huntington’s top team because there were not enough teams to compete in Division 1. Softball leagues have a rich history in the Town of Huntington. At the time the Huntington Softball Hall of Fame was founded the games were fastpitch, Coschignano said, but the league has since changed to slowpitch. Coschignano recalled days when he used to play softball almost six nights a weeks in several different leagues, but said the sport’s popularity is diminishing. Despite the league’s shrinking size, Coschignano said the friendship and camaraderie created through softball is unmatched. The Huntington Softball Hall of Fame will celebrate its 40th anniversary on Oct. 6 with an induction ceremony at Northport Yacht Club. Senior quarterback Quinn O’Hara (No. 3) leads the Walt Whitman football team onto the field before their 35-24 win over Sachem North. The Walt Whitman High School football team is off to an undefeated start this season. The Wildcats sit atop Suffolk’s Division 1 standings after a high scoring 49-46 victory at home against Brentwood on Sept. 7 and last Friday’s 35-24 home win against Sachem North. After a 2-6 record last season, last weeks victory over the Flaming Arrows of Sachem North, who beat the Wildcats last year, could be the beginning of a comeback season for Whitman. But a Wildcat victory didn’t always seem likely when Sachem North came to town. The Flaming Arrows dominated the first half with two huge plays. A 63-yard rushing touchdown and a 76-yard touchdown pass put Sachem North ahead 14-0 after the first quarter. The Wildcats’ defense settled down in the second quarter and their offense began to move the ball. The Whitman offense, led by senior quarterback Quinn O’Hara, scored 21 unanswered points in the second quarter. Three of O’Hara’s four touchdown passes came in the second quarter, two of which were caught by senior wide receiver DaShawn Thompson. Thompson finished with four catches for 59 yards in the game. The two teams went into the locker room at halftime with the game tied at 21, but momentum was firmly with the Wildcats. Whitman’s defense dominated the second half, holding the Flaming Arrows to just a field goal. 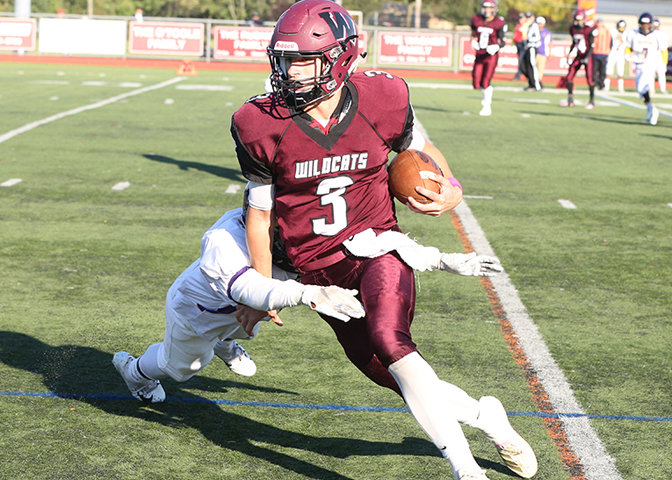 Grant Christensen, Jarrett Dalimonte, Tim Hunter each had an interception for the Wildcats, and junior linebacker Alex DiLorenzo recovered a fumble. Eric Bell and senior linebacker Christian Viteri each recorded eight tackles in the game. The fourth quarter was all Wildcats. O’Hara showed his skills on the ground as well as in the air with a one yard touchdown run. He ran the ball 11 times in the game for 40 yards. Whitman capped off the game with a late touchdown pass from O’Hara to wide receiver Kendall Wilkerson. The touchdown catch was Wilkerson’s second in the game, and one of seven total receptions for 77 yards. The Wildcats hope to keep their undefeated streak alive when they travel to Bay Shore on Saturday where they are scheduled to take on the 0-2 Marauders at 1 p.m.
Seahawks on the sidelines during the team’s 36-0 victory at Island Trees on Sept. 7. 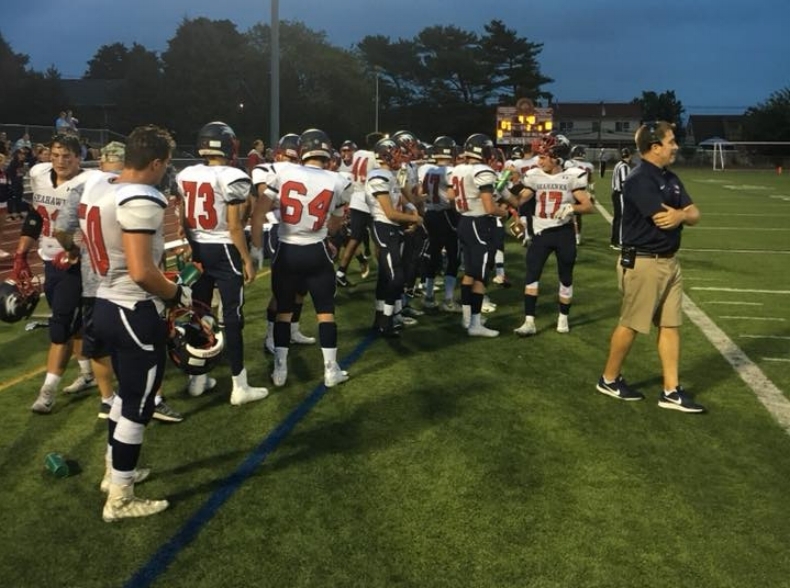 After winning their past two games, the Cold Spring Harbor football team is hitting its stride early. The team is finding its rhythm, head coach Jon Mendreski said. He attributes the team’s success to the previous season, partly because he has many returning players that have played together before, but also because the team lost in the county championship final last year, making them want it even more. Even though Mendreski believes there are still areas to improve on, he feels as the season progresses they will put in more work and figure it out. Last year, the team graduated around 20 seniors, which gives them of “young crop” of kids to work with. During the first few games, Mendreski and his staff have been watching the boys to devise their strategies. Mendreski highlights his captains’ work so far this season, considering them all standout players, they are Raymond Costa, Thomas Milana, Richie Striano and Aidan Adomaites. He mentions the Striano family, made up of senior, Daniel and junior triplets, Richie, Dom, and Peter, as very influential players for team. There is also Anthony Naccarato, who is a center and inside linebacker, that does a lot for the team and demonstrates great leadership. Mendreski considers Ethan Burdo and Kolton Gagnon, who play both offense and defense, phenomenal players. Also, his wide receiver and defensive back Casey Reynolds, scored a 46 yard touchdown pass last week. “We’re fortunate that we have a good offensive and defensive line,” Mendreski said. Along with coaching football, Mendreski teaches math to grades 7-12 and coaches the school’s crew team. He has coached football for 10 years, with this being his third year as head coach and has coached crew for 15 years. “They both are constantly relying on your team sports. If you’re talking about a team sport, those would both be close to the top of the list,” Mendreski said. The team has a big home game this Friday at 7 p.m. against Locust Valley and expects a tough schedule of games moving forward. They are looking forward to playing Seaford later in season, as they are the one seed and Cold Spring Harbor is the two seed. The top ranked team from the Town of Huntington in girls soccer coming into the 2018-19 school year are off and running this season. The Northport Lady Tigers were ranked at the top of this year’s preseason polls and are expecting a successful season on the pitch. The Lady Tigers are looking to repeat as Suffolk County champions again this season under coach Aiji Gipp. The Lady Tigers went 18-2-1 last season, losing only one regular season game and the Long Island title game to Massapequa. The season started well last Wednesday when the Lady Tigers opened the newly created Suffolk 1 division with a 2-0 win over Patchogue-Medford. Opposition goalkeeper Cat Saxon made seven save in a valiant losing effort, but Northport just had too much in the locker. Junior forward Olivia Carner got her name on the score sheet, while Lexi Sperling netting Northport’s second goal. Goalie Bailey Piper has some big shoes to fill in net after Emma Havrilla graduated in June, but a four-save shutout in her first game of the season was a good start. The Lady Tigers were quick to share the ball, and eager to communicate with their teammates. As a result, Izzy Yeomans and Paige Leonard each earned the assist on one of Northport’s goals. The Lady Tiger failed to build on this initial success two days later in their second game of the season when they struggled against Sachem East. After a goalless first half, the game could have gone either way when the teams took the field for the second half. Despite six saves by Piper, Sachem scored two second half goals to clinch a 2-0 victory against the Lady Tigers. Northport looks to get back to winning ways this afternoon when they host the undefeated Thunderbirds from Connetquot at 4 p.m.
John Glenn boys soccer game on Saturday, Sept. 22, will be followed by a ceremony honoring Sgt. Christopher Raguso, a former player who was killed when his helicopter went down on the Iraq-Syria border on March 15. The boy’s varsity soccer team at Elwood-John H. Glenn High School is off to a solid start this season, with a record of 5-0, the team is undefeated and hope they can keep it up the rest of the season. This year, the team’s coach, Lou Hanner, believes his team could win the county championship, something they have not done in more than 10 years. In the last three years, the team has lost only five games. Hanner attributes his team’s success to his players working in harmony on the field. “We have had a great group of guys who have grown into the team culture,” Hanner said. The team is playing two big games this week, on Wednesday, Sept. 12 against Shoreham and on Friday, Sept. 14 against Southampton. They will both be tough matches, but Hanner believes his boys can win if they put into play all the techniques and plays they have practiced for weeks. Hanner is in his 21st year of coaching soccer at John H. Glenn High School and feels he has a system that works for his team. At the moment, one of his captains and four year starter, Adam Astarita, is leading Suffolk County in scoring goals. His other captain, Nick Weiss, exemplifies hard work by getting into the starting lineup by putting in extra work during the offseason and summer sessions. Another reason the team has been able to work well together is because the team continues to play through the offseason. Starting the week after winter break, Hanner holds intramural soccer games on Friday mornings before school starts from 6-7 a.m. This extra play time gives them a leg up on other team’s who only play during the season starting in June. It also gives Hanner and his coaching staff a chance to observe their players and learn more about their playing styles and commitment. Typically, 10-20 students will participate in a game and those who do find it helps them greatly. The intramurals are open to the entire school so at times Junior Varsity players will join a game and give the coaches a chance to look forward to future players. The season really picks up in June during Brookhaven Summer League. This is when coaches can figure out who their core group of players are. One team they are most looking forward to playing against is Centereach, who are the defending State Class B champions and won against John Glenn twice last year. If the team can make it through the playoffs, they will likely face them in County Semi-Finals or Finals. The next team they would play would be the Nassau County Finals winner, then they would go on to the Final Four State Championship. But first, they must conquer their county, which is looking to be more difficult this year than ever since New York state recently changed the class system to drop more schools from Class AA to Class A. “We’re one of the smallest schools in the class, but we’ve been good enough to win them... we just haven’t yet,” Hanner said. The team is also looking forward to their game on Saturday, Sept. 22, that will be followed by a memorial ceremony for Sgt. Christopher Raguso, a former player and graduate of John Glenn that was killed in service when his helicopter went down on March 15. The team will be putting up a flag pole and monument in his honor and have a GoFundMe set up to raise money for the memorial. The game is at 10 a.m. and the ceremony is scheduled to begin at 12 p.m.
Ex-Chief Lou Agiesta threw the first ball to Chief Mike DePasquale to kick off the 30th Cops vs. Fireman softball game.